Finding a good electrician to complete electrical wiring services can be complicated. With all of the certified electricians servicing the Phoenix metro area to choose from, how do you separate those that are highly qualified electricians that will provide exceptional and affordable service from others? Fortunately, the solution is rather simple. There are three important questions that you should ask any electrician that provides residential electrical wiring services to protect your home and ensure you’re receiving top-notch service. Question #1 – Are you Licensed to complete Residential Electrical Wiring Services? The first step you should take when looking for a reliable electrician to complete your electrical wiring services is to make sure they are licensed to complete residential electric wiring in the State of Arizona. There are several private electrical contractors that might be more than qualified to complete those repairs or services; however, if they are not certified by the State of Arizona, you could be liable for fines or damages done to your home. Hiring a general electrical contractor that has taken the proactive steps to become licensed and certified also shows you their dedication to ethical business dealings – providing you with peace of mind knowing that you’ve hired a good electrician. Question #2 – What Type of Experience Do You Have in Residential Applications? Just like finding a certified electrician, retaining the services of an electrician that has extensive experience in residential repairs and service is a smart idea. If you were trying to decide on a mechanic to work on your diesel pickup truck, the smart choice would be to find a mechanic that specializes in diesel engines – not just a shade-tree mechanic that has basic knowledge. The same concept applies to hiring a residential electrical expert. 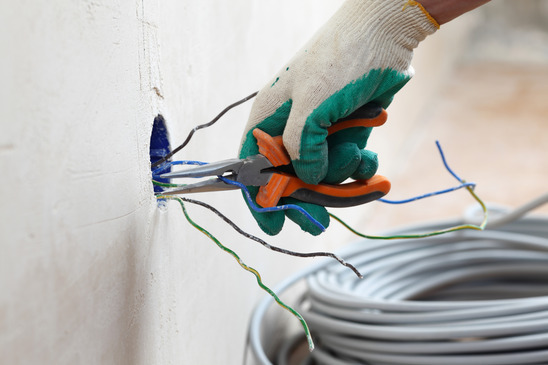 There are several differences between commercial electrical work and residential wiring services. So if you’re looking to have residential services completed at your home, you want to make sure you hire an expert that specializes in residential electrical services. Question #3 – What type of Insurance or Warranties Do You Provide Residential Customers? Protecting your home and family from damage done by any contractor is another important attribute to be aware of when hiring any electrical contractor. For the most part, residential electrical contractors are all licensed, insured and bonded to perform all residential electrical repairs. However, when you’re interviewing any potential contractor, make sure to ask them about their protection or insurance policies that protect your home and its residents. It’s also a good idea to ask them about the guarantees or warrantees they provide for the work they deliver at your home. Quite often residential electrical contractors will work with you to put together a protection or warranty program that offers you peace of mind. But, you’ll never know unless you ask before they work on your job. There are several good electricians operating in the greater Phoenix metro area. However, there are also contractors that may say they can help solve your problems and may take advantage of naïve residential customers also. Make sure you ask any residential electrical contractor several questions; including the ones above, to make sure you hire the right person to complete all of your residential electrical wiring services.